If you're tired of trawling the malls but still looking for Christmas gift ideas, try the Ice Cream Recipes Online Store (in association with Amazon). There's a great selection of ice cream makers including electric machines and hand crank ones plus a fabulous range of ice cream books covering homemade ice cream, ice cream sundaes and gelato. This 5 star rated artisan gelato book is a great example. So what if they've got an ice cream maker and all the ice cream books they'll ever need? 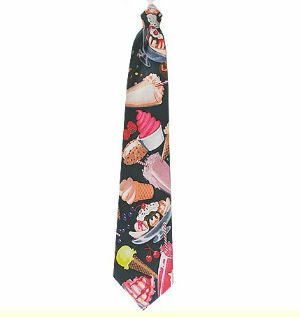 Well, you could try something just that little bit different but still on an ice cream theme, such as ice cream ties and ice cream jewelry. And what if you're buying for someone who doesn't like ice cream (that would be sad but could of course happen!) - ? Well, you can always try a themed gourmet gift basket - from Victorian Lace to chocolate to tea.